Muslim Leader, ZAFAR, and Buddhist Leader, KYOGEN, to Speak at COEXIST! OK, COEXIST has gotten out of hand. That is, out of my hands. There is something bigger going on. There's no way I could have planned this. If you have been watching the news as of late, you have seen local Islam leader, Harris Zafar, on the news. It is his Mosque that organized the Vigil of Friendship on Sept. 11th. He will be joining us this Friday night, September 17, 2010 for our first COEXIST Celebration. Also, Kyogen Carlson, the Abbot at Dharma Rain Zen Center in Portland, will be leading us in meditation. A group from the Baha'i faith will be adding music and much more. Like I said, it's out of my hands. I've turned it over to God. 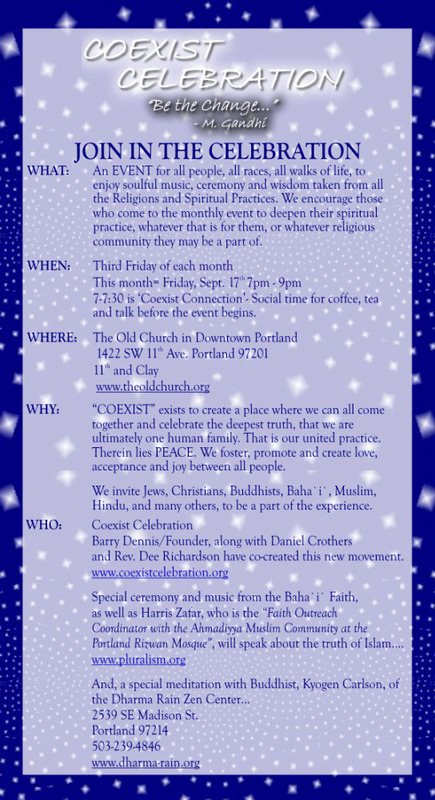 Above is an invitation for you to send to your friends about the COEXIST EVENT that is happening on Friday, September 17! Maybe your friends have been asking you what it is all about! Or, maybe you haven't known quite how to explain it to them. Well, here it is! It is truly going to be an exciting evening and one that we will not soon forget!! Harris Zafar is such a delight!! The meditation with Kyogen Carlson will renew your soul and the music and ceremony with the Baha`i` and our Jewish friends, will prove to fill you up! And then there's BARRY!! Barry is going to prove once again, that his 'genius' never sleeps!! Can't wait to see you all there! Come early and share in coffee, tea and talk before the event begins!! The Old Church has been a landmark in Portland since its completion in 1883. The Carpenter Gothic architecture of this beautiful church, designed by Warren Williams, combines the spare simplicity of the Presbyterian denomination with the grandeur of the founders' aspirations. Fifty Presbyterians organized the congregation in Portland in 1882. Featuring Carpenter Gothic architecture, the church was designed by Warren Williams and completed in 1883, combining the spare simplicity of the Presbyterian denomination with the grandeur of the founders' aspirations. The original church served Presbyterian and Baptist congregations until 1967. Since then, the building was saved from destruction and lovingly restored by concerned and generous citizens. Highlights of the restored church's architecture include its Gothic stonework exterior, leaded, stained, or frosted glass windows by Povey Bros. of Portland, an interior that abounds in detail, and late Victorian furniture. The church hosts many special events, meetings, and fairs throughout the year and is available for weddings and commitment ceremonies, concerts, receptions, programs, conferences, and other private galleries.